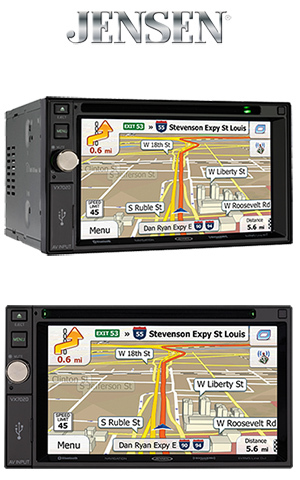 The VX7020 is our top of the line double DIN multimedia receiver with app control and built-in Bluetooth and Navigation and features a 6.2-inch high resolution TFT touch screen and app connectivity for iPhone�, Android� and BlackBerry� - Connect your iPhone (via jLinkUSB) and control Pandora Link from the touchscreen. Android�, Apple and BlackBerry users can also connect via Bluetooth to stream, control and enjoy Pandora, SXM, iHeartRadio, aHa Radio, Spotify, Slacker, TuneIn and many more Internet Radio Apps. This unit offers built-in iGo Primo Navigation with Naviextras Web Support (download other countries, POI and value features) while also offering Bluetooth hands free calling with phone book accessibility and music streaming from A2DP equipped phones with audio controls for Android�, iPhone� and BlackBerry� devices. Additionally, it is SXM Ready featuring channel art.